Christmas is just 5 days away! There's still time to get the perfect gift for any guy in your life (whether it's your dad, brother, boyfriend, husband, or best friend!). These gifts are all great options that I'm sure any guy would find very useful. 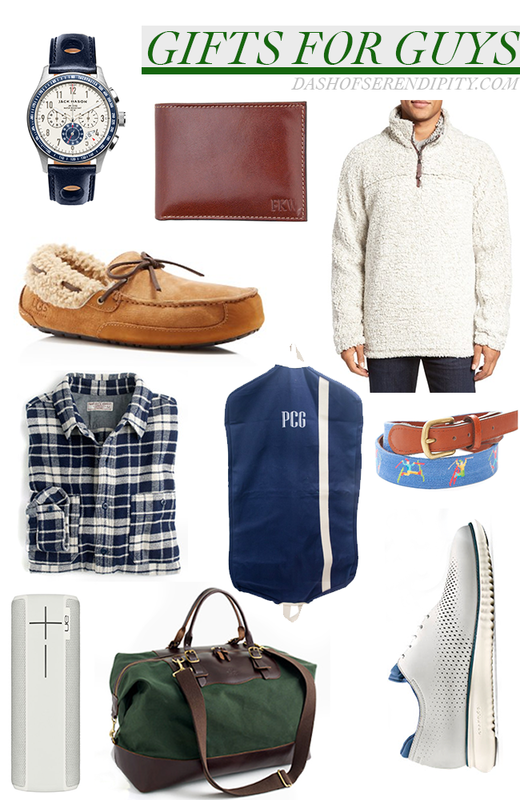 I find guys to be hard to shop for, but these are fool-proof gifts they're sure to love! Jack Mason Watch I have one of the Jack Mason women's watches (it'll be on the blog soon!) and my brother actually commented on how nice it is the other day. He's a big watch fan, so I feel like this could be a thoughtful gift for any guy. Wallet A few years ago I gave my brother a wallet just like this one and he surprisingly loved it. My brother is hard to please, so knowing he liked a gift is very pleasing. True Grit Pullover This pull over is so soft and I know plenty of girls who would love to steal it! Ugg Moccasin If you're a girl, you and uggs probably go waaay back (hello 2009? ), but these moccasins are perfect to wear around the house. If you know a guy in college, these make the perfect run-to-the-dining-hall footwear choice. Flannel Button Down A classic button down is an instant hit! Monogram Garment Bag Most guys would never think to buy themselves a garment bag, but chances are he'll be traveling with a suit or jacket at some point in his life. This is a great gift for those occasions. Needlepoint Belt Another practical, yet fun gift! Wireless Bluetooth Speaker My friend has this speaker and it sounds great in small spaces or larger ones! Weekender Bag This is a great gift because weekender bags are so useful as a carry on while flying or if you're going on a road trip. Sneakers How fun are these dressy sneakers? I love that you can dress them up without sacrificing the comfort of a sneaker.